After a bath, Natalie likes to run around naked. Once dry and out of her towel, she will wriggle free and dash out into the living room and surprise any guests that may be around. Sometimes she has so much fun being naked that she will refuse to put on her diaper or change into her clothes. Natalie likes to pry into other people's belongings. 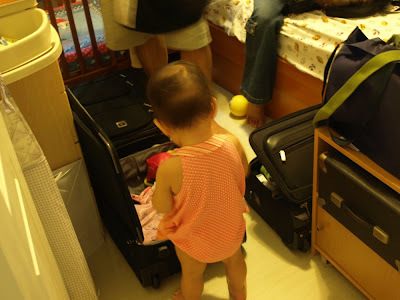 Here she is looking through Alex and Vanessa's suitcases as they are trying to pack. Helpfully, she pulls out the things they just put in. Natalie likes to throw, drop, squish, and mash things, especially food. 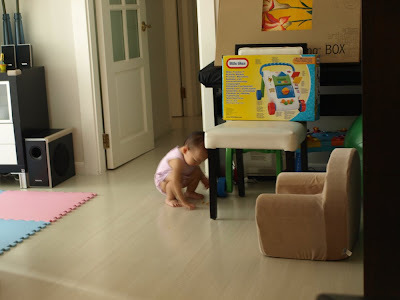 Here she is mashing her ritz cheese cracker into the floor. The cheese sticks to the floor and Natalie tells me it's "tuck!" Natalie likes to squat. When tired, when bored, or when trying to get closer to the ground to study something, she'll squat at home, in the middle of the mall and on the sidewalk. I call it her "mainland squat". Natalie likes to watch TV. Whenever I turn it on, it's like magic... Natalie becomes a TV-zombie and I can pretty much do anything I want to her like feed her (auto open mouth, chew, and swallow and repeat) . She doesn't have a TV habit though... maybe once a week for 10 minutes (while I'm cutting her nails). Or on special occasions such as when her cousins are over for a visit. Check out the 3 TV zombies below. TV is your baby sitting friend :P It's addictive, captivating, entertaining and highly instructive. It's the 21st century's brain washing tool for kids! !